Surface Drain Installed next to sidewalk in Oklahoma City. A Surface Drain may come in many different shapes or sizes. It is a Drain Basin with a Drain Grate on top and a Drain Pipe connected on the side. The Drain Grate may be round or square. 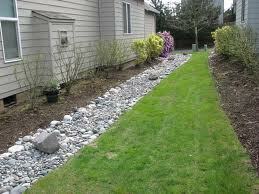 A French Drain is completely different from a Surface Drain. A basic French Drain consists of a Perforated Drain Pipe in the bottom of a trench. A Trench Liner is sometimes used depending on the Drainage System Design and the type of soil. The Drain Pipe should have a neoprene sock around the Perforated Drain Pipe. This is to ensure that the Drain Pipe does not become clogged. A trench is dug that is slightly wider than the French Drain Pipe that is being used. There are several sizes. Three Inch, Four Inch, and Six Inch are the most common sizes of French drain Pipe. The dirt that is taken out to make the trench is hauled away. It is replaced by some type of small stone or gravel depending on what is desired or available. I prefer crushed 1 inch lime stone. It is the most economical option in my area. Pea Gravel or some other type of small stone can work just as well. The lime-stone or gravel is placed in the trench on top of the perforated Drain Pipe and filled all the way to the surface (ground level). In some cases where the French Drain needs to be deep or is being placed in sandy soil, a special trench liner must be placed in the trench before the perforated Drain Pipe or the Gravel are installed. This helps maintain the integrity of the trench over time. It also increases the cost of the French Drain and the amount of time to install it. I install a trench liner in a French Drain about 20% of the time. Most of the time a liner in not needed. CMG Sprinklers and Drains – 405-226-0629 — cmgsprinklers@hotmail.com — Do you have Drainage Problems from stormwater runoff? Do you need Drainage Solutions for: Yard Drainage, Basement Drainage, Driveway Drainage, or Landscape Drainage? CMG can help with the installation of a : French Drain, Channel Drain, Surface Drain, Trench Drain, Basement Drain, or a Drainage Sump Pump. We also Specialize in: Sprinkler System Installation and Sprinkler Repair. Servicing: Oklahoma City, Norman, Moore, Mid West City, Del City, Edmond, Purcell, Yukon, Mustang, or Blanchard. Sprinkler Irrigation Systems — If you are considering an Automatic Sprinkler System for your home or business in 2012, check out an Irrigation System designed by CMG Sprinkler and Drain. Our Sprinkler Systemsare fully automatic. The Sprinkler Controller can be placed indoor or outdoor. One of the most important aspects of our Sprinkler Design is the “SELF-DRAINING FEATURE.” The Sprinkler Pipes Drain Automaticallyunderground every time the Irrigation System stops running or is turned off. Older or poorly Designed Sprinkler Systemsmust be WINTERIZED every fall and checked out again every spring. Homeowners pay Sprinkler Companiesto maintain this twice-a-year routine as long as they own the Sprinkler System. A Sprinkler System Designed and Installed by CMG — NEVER HAS TO BE WINTERIZED. BY THE TIME WINTER COMES THERE IS NO WATER IN THE SPRINKLER PIPESTO FREEZE. 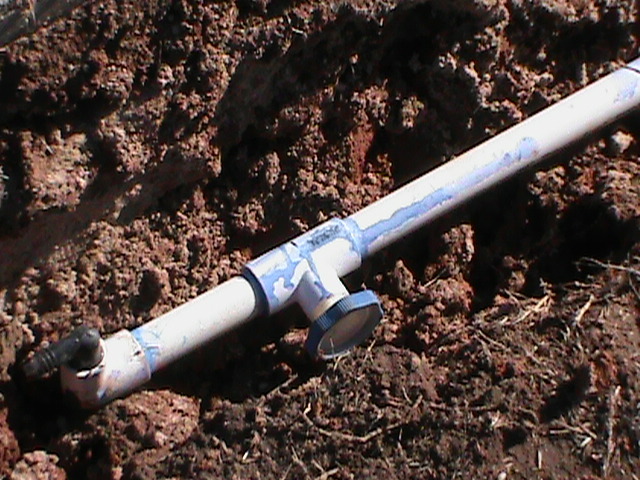 If it gets hot during late winter or early spring and the homeowner wants to run the Sprinkler System, no problem! Just turn the Sprinkler Systemon at the Sprinkler Controller and run it normally. There is no need to pay a Sprinkler Companyto prepare your Sprinkler System for Winter. YOUR SPRINKLER IRRIGATION SYSTEMBY CMG IS READY WHEN YOU ARE! This is a picture of an “IN-LINE-DRAIN“. Many Sprinkler Contractors don’t take the time or don’t want to spend the extra money to install them. IN-LINE-DRAINS are a central part to all of our Sprinkler System Installation. Central Oklahoma is no stranger to heavy thunderstorms and hard rain. Storm-Water Runoff can cause damage to sidewalks, driveways, foundations and all other things made of cement and concrete. Trees, shrubs, and grass can also become damaged by flooding. CMG Sprinklers and Drains can design a Drainage System to protect your property from standing water. Our Drainage Systems can be simple constisting of a French Drainor a Surface Drain, or more complex requiring multiple types of Drains and exit points. CMG Utilizes: French Drains, Surface Drains, Channel Drains, Basin Drains, Basement Drains, Trench Drains, and Sump Pumps. Servicing all of Central Oklahomaincluding: Moore, Norman, Edmond, Oklahoma City, Del City, Midewest City, Purcell, Newcastle, Blanchard, Yukon, and Mustang. The dirt that was taken out to make the trench is hauled away. It is replaced by some type of small stone or gravel depending on what is desired or available. I prefer crushed 1 inch lime stone. It is the most economical option in my area. Pea Gravel or some other type of small stone can work just as well. The lime-stone or gravel is placed in the trench on top of the perforated Drain Pipe and filled all the way to the surface (ground level). In some cases where the French Drain needs to be deep or is being placed in sandy soil, a special trench liner must be placed in the trench before the perforated Drain Pipeor the Gravel are installed. This helps maintain the integrity of the trench over time. It also increases the cost of the French Drain and the amount of time to install it. I install a trench liner in a French Drain about 20% of the time. Most of the time a liner in not needed. The main downfall of a French Drainis that they, for the most part aren’t very pretty. They don’t look very nice in a yard once they are completed. The Sprinkler System Problems listed above are the most common Sprinkler Problemsthat we deal with. CMG Sprinklers and Drains – can help if you need to re-design your Sprinkler System. If for example you are adding a swimming pool in your back yard, we can move the Sprinkler Heads and Sprinkler Pipesto fit the new dimensions of your yard. We can redesign or add-on to sprinkler systems where the home owners needs change. Norman Oklahoma Drainage System Contractor, French Drains, Sprinkler Repair.